At a reception April 6, President Mark B. Rosenberg recognized FIU faculty members from a breadth of disciplines for their outstanding achievements. Faculty honored at the April 6 reception: back row from left to right -- Dionne Stephens, Lillian Kopenhaver, Chongsheng Cao, Rajamani Narayaman, Michael Heithaus, Nezih Pala, Quentin Felty, Jason Liu, Raju Rangaswami, Mario de la Rosa, Provost Douglas Wartzok, President Mark B. Rosenberg, Deron Burkepile, Madhavan Nair, Alexander Agoulnik, Les Standiford, Alex Acosta, Pedro Greer, Laurel Collins, Judith Stiehm. 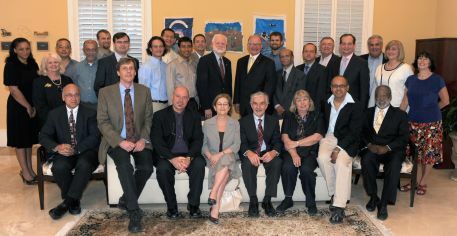 Front row, from left to right -- Thomas Baker, Laird Kramer, Orlando Garcia, Meredith Newman, Richard Bone, Sherry Johnson, Benjamin Baez and H.T. Smith. More than two dozen distinguished members of the FIU academic community – world-class scientists and researchers, authors and scholars – gathered at the Ronald Reagan Presidential Home on the Modesto Maidique Campus to be honored for their accomplishments in their respective fields. Alexander Acosta, dean of the College of Law, was named “One of 100 Most Influential Hispanics” in the country by Hispanic Business Magazine. Richard Bone, professor in the Department of Physics, was named a “Silver Fellow” by the Association for Research in Vision and Ophthalmology in 2010. Pedro Jose Greer Jr., assistant dean for academic affairs and chair of the Department of Humanities, Health, and Society, College of Medicine, was awarded the 2009 Presidential Medal of Freedom given in part for his work with the Camillus Health Concern. Lillian Lodge Kopenhaver, dean and professor in the School of Journalism and Mass Communication, was the recipient of the Outstanding Woman in Journalism and Mass Communication Education Award for 2009 from the Association for Education in Journalism and Mass Communication (AEJMC). Rajamani Narayanan, associate professor in the Department of Physics, was named a Fellow of the Council of the American Physical Society for his groundbreaking work on exact chiral symmetry and topology on the lattice and important contributions to the nonperturbative calculation of the running coupling in non-Abelian gauge theories. Judith Stiehm, professor in the Department of Politics and International Relations, received the 2008 Frank J. Goodnow Award from the American Political Science Association. Dr. Stiehm has been invited to serve as the Distinguished Visiting Professor at the U.S. Air Force Academy next year, the 30th anniversary of women’s graduation from the Academy. Alexander Agoulnik, professor in the Department of Human and Molecular Genetics, College of Medicine, was recognized for innovative research in his laboratory supported by grants from NICHD, NCI, and other research foundations. Mario de la Rosa, professor in the School of Social Work, is a NCMHD, NIDA, and NINR funded researcher on Latino health disparities and Director of CRUSADA, a multidisciplinary NIH Center of Excellence. Quentin Felty, assistant professor in the Department of Environmental/Occupational Health, is a newly established scholar with funding from NIH and the Florida Biomedical Research Program for his innovative research on Metastases and Promotion of Aggressive Neovascular Phenotype in Breast Cancer. Laird Kramer, associate professor in the Department of Physics, and founder of the Physics Education Research group, runs a successful NSF funded Center for High Energy Physics Research and Education Outreach program. Jason Liu, assistant professor in the School of Computer and Information Sciences, received an NSF CAREER award for his research on Immersive Large-Scale Network Simulations and several research awards in the areas of network modeling and simulation, and high-end computing systems. Madhavan Nair, professor/chair in the Department of Immunology and associate dean of biomedical research, College of Medicine, was recognized for his continued funding by federal agencies like NIH/NIDA, while also recruiting and mentoring new research talent. Nezih Pala, assistant professor in the Department of Electrical and Computer Engineering, received an NSF CAREER award for his research on Nanoscale Multi-element Plasmonic Devices for Tunable THz Detection Applications. Dr. Pala’s research is expected to result in new technologies in medical imaging and diagnosis, chemical and biological sensing, and security surveillance. Raju Rangaswami, associate professor in the School of Computer and Information Sciences, received a Hecura award for his research on Streamlining High-end Computing with Software Persistent Memory. This project develops Software Persistent Memory, a novel abstraction for using storage systems that combines the simplicity of a memory interface with the persistent properties of storage. Benjamin Baez, associate professor in the Department of Educational Leadership and Policy Studies earned the 2009 CHOICE Outstanding Academic Title Award from the SUNY Press for his title “The Politics of Inquiry”. Deron Burkepile, assistant professor in the Department of Biological Sciences, received an Editor’s Choice Award by Science magazine for “Herbivore species richness and feeding complementarity affect community structure and function: the case for Caribbean coral reefs”. Denise Duhamel, associate professor in the Creative Writing program in the Department of English, was named Best Local Poet by the Miami New Times in its Best of Miami 2009 issue. Orlando Garcia, chair of the School of Music, was nominated for a Latin Grammy Award for Best Classical Contemporary Composition “Cuatro Asimetrias” for guitar quartet. Meredith Newman, director of the Department of Public Administration wrote “Emotional Labor: Putting the Service in Public Service”, which earned the Research Best Book Award by the Section on Public Administration Research of the American Society for Public Administration. Les Standiford, professor of English, received the “Best Book by a Local Author” award in the 2009 edition of the Miami Times’ “Best of” edition for his book “Washington Burning”. Thomas Baker, professor in the College of Law, was elected a Fellow in the American Academy of Appellate Lawyers and designated a Life Member of the American Law Institute in 2009. Luther Brewster, assistant professor in the Department of Humanities, Health and Society, College of Medicine, was awarded the prestigious Marshall Memorial Fellowship (MMF) by The German Marshall Fund of the United States in recognition of his groundbreaking work for underserved populations. Laurel Collins, associate professor in the Department of Earth and Environment/Biological Sciences, was appointed president of the Cushman Foundation for Foraminiferal Research in 2009. Sherry Johnson, associate professor and director of graduate studies in the Department of History, was appointed president of the Latin American/Caribbean Section of the Southern Historical Association. Cesar Levy, professor, graduate program director, and chair in the Department of Mechanical and Materials Engineering, was appointed a Fellow to the American Society of Mechanical Engineering (ASME). Marie McDemmond, interim dean of the College of Education, is the board chair-elect of the Lumina Foundation for Education and President Emeritus of Norfolk State University. H. T. Smith, professor in the College of Law, was named for the third year in a row as Super Lawyer by Florida Super Lawyer Magazine. Professor Smith was selected to The Best Lawyers in America for the past 12 years, and was this year’s recipient of the Judge David Dyer Professionalism Award, the highest award given by the Dade County Bar Association.